They say you are what you eat. But do we know what we are eating? Do we know who is cooking and serving us the food we take to our kitchens and then into our bodies? The more I dig into this issue it becomes clear that our world of food is spinning in directions we know nothing about. Take honey. 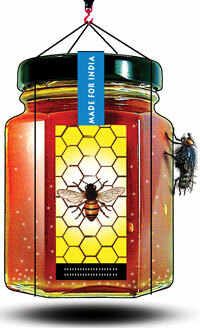 A sweet preserve we take for granted that it comes from bees, which collect it from the nectar of flowers. We pick up the bottle from a local shop, believing the honey was collected naturally, is fresh and certainly without contaminants. In most cases, we think that small farmers produced it or it was collected from the wild and packaged by large companies. We consume it as a natural tonic against the chemical assaults of the modern world. But little do we know how the business of honey has changed. Nobody explains us that the culture of food is linked to biodiversity. And this is further connected with the business—and not pleasure of food. But mess with biodiversity and you mess with food. The ubiquitous bee is one such instance. Some decades ago, leading scientific institutions in India sold the idea of introducing the European bee (Apis mellifera) into the country. This prolific honey producer bee took over the business, virtually replacing the humble but more adapted Indian bees (Apis cerana and Apis dorsata) from our food. At the same time, the business of honey moved away from small producers, collecting honey from the wild and cultivating it in natural conditions. It became a highly organised business, controlled by a handful of companies that handle all aspects of the trade—from the supply of queen bees to the paraphernalia of bee-housing, from feeding and disease control to linking up with producers across different states. It is an outsourced business, run by franchisees whose job is to find places, like the apple farms of Himachal, where there is nectar for bees. We have lost the biodiversity of the bee—largely Apis mellifera now makes our honey—and we have lost the diversity of the business. Business is now about commerce, not food. But nature has its way of getting back at us. The European bee is showing signs of overuse across the world. In the US and Europe there is worrying news about honeybee colony collapses—bees are disappearing from colonies. This is in turn is hitting crop production as bees play a critical role in pollinating food crops across the US—a service, officially billed at some US$ 20 billion annually. The trade in pollinator bees involves carting bee colonies across the county, where crops need their service. But now there is evidence that such overwork, combined with the use of nasty new pesticides, new diseases and immune-suppressed bees, is destroying bees. In India, things are no different. The dependence on an introduced species and emphasis on overproduction means the overworked bees are susceptible to diseases. The creatures are immune-suppressed and not adapted to local conditions. So, the answer is to feed bees antibiotics mixed liberally in sugar syrup. The bee makes honey and with it comes the lethal dose of antibiotics. When the Pollution Monitoring Laboratory of the Centre for Science and Environment (CSE) checked honey, it found cocktail of antibiotics—mostly banned and prohibited in food. It found everything from the commonly used Ampicillin, Enrofloxacin, Ciprofloxacin, Erythromycin to the strictly banned Chloramphenicol in honey made and packaged by the biggest and the most known. Any doctor will tell you these antibiotics in food are bad, because they not only have health impacts but also make disease-causing bacteria resistant to antibiotics. Over-exposure to antibiotics is not just leading to super-bugs in hospitals. We are also getting small doses of antibiotics through food. Because of this doctors want us to be careful with antibiotics. It is also because of this that food regulators say there should be no—or minimum and controlled— antibiotics in our food. This is where the equation between big businesses and food gets murky. CSE’s laboratory checked two foreign brands bought from our local store. We know Europe has banned Indian honey for having these antibiotics. They did this because they say they care about their health. Good. But then who cares about our health? Both brands we checked had high levels of antibiotics. The health-conscious companies, in this case from Australia and Switzerland, do not check antibiotics in products they export to our world. It is about double-standards and it stinks. But why should they care for our health, when our government does not? The same government, which makes strict standards for exported honey, does not care about what we use domestically. There are no standards for antibiotics in Indian honey. This is the age of big and powerful business taking over our kitchen, because we have complicit food regulators. The recently set up Food Safety and Standards Authority has been dead on entry. Do not be surprised. Be angry. This is not a business we should allow for takeover. It is about us. Our bodies. Our self. Ms.Sunita is right when she says that we should be angry about this apathy of our own govt towards its citizens. While we export better honey to EU and rest of the world because the EU or other countries are concerned about their citizens health (check Denmark standards), Indian govt is ignorant or careless about its own citizens health and hence no specific standards are mandated. If there are standards, the standards are breached by greedy companies and corruption in the govt and the regulators takes over to ensure the end consumer is left high and dry and the middle men and govt/regulators make hay. It's time that the Indian consumer becomes vigilant and avoid these products from their diet. Thanks to Ms. Sunita led CSE's effort in bringing out these research findings and educating the indian citizens at large. It is not about boycotting products (for our government really does not care), but about boycotting our dirty politicians and encouraging some real leadership in the country! CSE has certainly been showing some good leadership - how can we help transform this into real action? We need people in politics who are there not for the money but for the passion of doing good for their people. This is of grave concern and it is good that CSE is highlighting it. But what use is it if you do not publish the list of brands with contamination? What have I gained from reading this article? Only the nagging fear that what my family and I are eating is unhealthy. Now I don't know what honey to buy or not buy. I think you have not read the article which details about the various brands CSE tested and contamination level in each of them. Read it here http://www.downtoearth.org.in/node/1944. The information you are looking for is there in the cover story. Read on. Best! > The bee makes honey and with it comes the lethal dose of antibiotics. While it is of concern that antibiotics may be in our food supply, the amount of antibiotic found in honey is typical a few parts per billion. There amount would have no effect on any living organism, is infinitesimal, and is certainly nowhere near a lethal dose. > Oral administration of 400 parts per million per day for a period of 57 days was tolerated by dogs. I was a member of the Sri Lanka Bee Farmers' Association (SLBFA) for many years. This NGO is presently inactive following the demise of several of its most enthusiastic members. However, I was President for an year and have had discussions with visiting European beekeepers and in Nairobi in the course of a visit to Kenya. Sri Lanka has Apis cerana (formerly known as Apis indica) and Apis dorsata. The importation of colonies of Apis mellifera and its products, such as wax, was banned due to fears that they would bring bee diseases into the island. However, there was a case several years ago of two colonies of Apis mellifera being brought in (from Japan?) by persons, who treated patients suffering from rheumatism (arthritis?) with bee stings free of charge. We informed Customs that the importation of these two colonies of Apis mellifera should not have been allowed. They asked us what should be done about the colonies which had entered the country. We gave them our advice. Apis dorsata is found in large colonies, which produce substantial quantities of honey and wax. These are harvested in the wild in rural and jungle areas. The low annual production per household is of importance when it comes to testing the quality of bees honey. We were concerned at the time that the occasional bottle of locally produced honey may have been adulterated with sugar syrup. However, having a reputable state agency test a sample of bees honey for quality was relatively costly and beyond the means of a local beekeeper. I understood at the time that honey and wax needed for ayurvedic preparations was imported from India. The bottled bees honey I see in the local supermarkets seem to be imported from Australia. The SLBFA was asked to help set up a Beekeeping Project in Nochchiyagama in an agricultural area of the Mahaweli Development Agency; a state agency. We were happy to do so; although we would have preferred a different location. It got underway but I later learned that it was running into difficulties due to the insecticides in use in the area.